Comment: Deliveries to Canada 2-5 working days via Fedex, due to Canada Post issues. Used - Good. Ships from UK in 48 hours or less (usually same day). Your purchase helps support the African Children's Educational Trust (A-CET). Ex-library, but has been well cared for. 100% money back guarantee. We are a world class secondhand bookstore based in Hertfordshire, United Kingdom and specialize in high quality textbooks across an enormous variety of subjects. We aim to provide a vast range of textbooks, rare and collectible books at a great price. Through our work with A-CET we have helped give hundreds of young people in Africa the vital chance to get an education. We provide a 100% money back guarantee and are dedicated to providing our customers with the highest standards of service in the bookselling industry. One of the major open questions in high energy physics and cosmology is the nature and origin of dark matter. 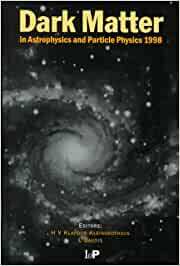 Dark Matter in Astrophysics and Particle Physics 1998 provides a comprehensive overview of the current status of research in this topical field. The book brings together leading researchers from around the world to review recent progress and future directions for research in the different approaches to the dark matter problem. It collects results from cosmology, large-scale structure, and accelerator and nonaccelerator physics. The book also reviews the correlations between and the virtues of each of the fields for the determination of abundance, nature, and origin of dark matter. This text is an essential reference for the expert and the insider. It provides challenging territory for the trained scientist to explore. This book would be of considerable value to both particle-cosmology theorists, astrophysicists concerned with observational evidence for dark matter, and also experimentalists developing detectors for dark matter.